Temple received an oral commitment Saturday from Egg Harbor Township graduating senior Yvandy Rigby, which was confirmed by EHT head football coach Kevin Stetser. The 6-foot-2, 217-pound Rigby could play either free safety or linebacker. Stetser says taht Rigby will attend Milford Academy in the fall and enroll at Temple in January. Rigby had 57 tackles and 12.5 tackles for loss last season, including four sacks. He also had 14 receptions for 147 yards. What is amazing is that he only has played organized football for two seasons. He is originally from Turks and Caicos a British Overseas Territory southeast of the Bahamas. "He blew them away today at the Temple camp," Stetser said. "He ran a 4.5 [40-yard dash] and did it three times." Stetser said Rigby jumped 40 inches at an earlier Milford Academy camp. "He will get another season to play football against a much higher level of competition [than high school]," Stetser said. "He is a great kid and his better football is ahead of him." This is a busy time for Temple recruiting. Rigby became the seventh player committed for the class of 2019. According to the source, Newark Central TE-LB Mohammed Kamara visited Temple on Saturday. He is the brother of former Temple football player Amara Kamara. 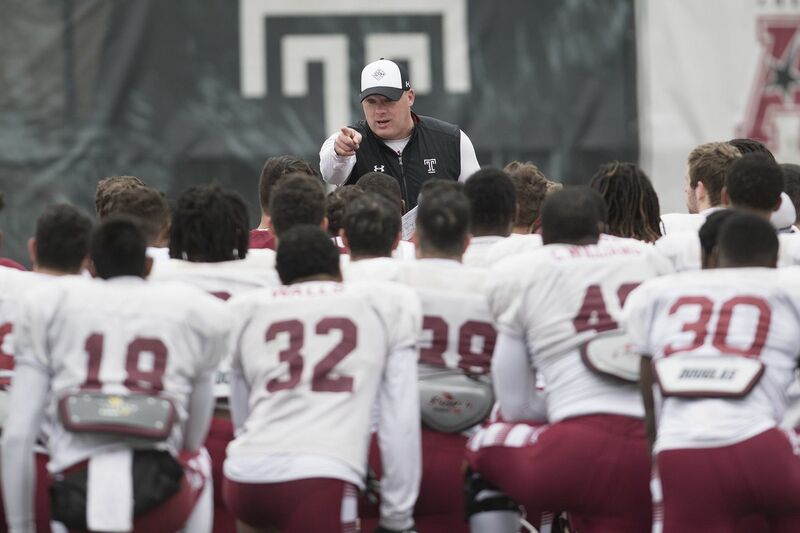 Two South Jersey players plant to visit Temple this week: St. Joe Hammonton lineman Wisdom Quarshie and Moorestown linebacker Josh Pearcy. Quarshie was an Inquirer first-team all-South Jersey selection from South Jersey's No. 1 team. MJ Griffin, 6-1, 180, DB, Saline, Mich.
Kwesi Evans, 6-3, 190, WR, St. Frances Academy, Baltimore. Josh Fuga, 6-2, 320, DL, Freedom High School, Woodbridge, Va.
Jordan Magee, 6-3, 205, LB, Dover, Del. Tenyeh Dixon, 5-11, 185, Woodson, Washington D.C.
Simon Abedinungu, 6-5, 227, TE-DE Richard Montgomery High School, Rockville, Md. Yvandy Rigby, 6-2, 217, FS/LB, Egg Harbor Township, N.J. / Milford Academy, New Berlin, N.Y.